“The Dark Knight Rises” arrives on Blu-ray, DVD and Digital Download from 3rd December. In the epic conclusion to filmmaker Christopher Nolan’s The Dark Knight trilogy, Gotham City is threatened by the masked terrorist Bane, forcing Batman to return from an eight-year absence and fight for his city one more time. “The Dark Knight Rises” will be available on 2 disc Blu-ray and on single disc DVD The Blu-ray features the film in hi-definition on Blu-ray and in standard definition on DVD. “The Dark Knight Rises” Blu-ray disc takes advantage of the marriage of IMAXÒ and 35mm formats by using the hybrid master to replicate the unique theatrical experience of integrated film formats. 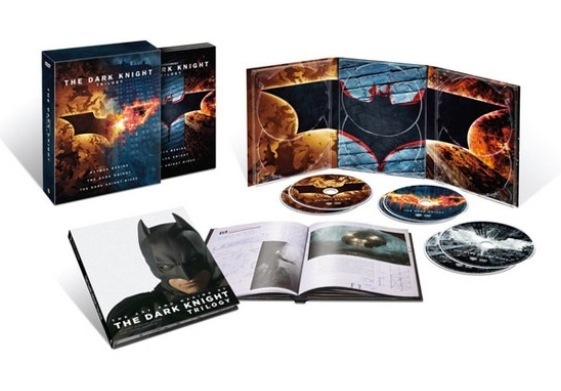 The Blu-ray is also available in limited edition Bat Cowl packaging. Both the Blu-ray and the single disc DVD include UltraViolet which allows consumers to download and instantly stream the standard definition version of the film to a wide range of devices including computers and compatible tablets, smartphones, game consoles, Internet-connected TVs and Blu-ray players. Leading an all-star international cast, Oscar® winner Christian Bale (“The Fighter”) again plays the dual role of Bruce Wayne/Batman. “The Dark Knight Rises” also stars Anne Hathaway as Selina Kyle; Tom Hardy as Bane; Oscar® winner Marion Cotillard (“La Vie en Rose”) as Miranda Tate; and Joseph Gordon-Levitt as John Blake. Returning to the main cast, Oscar® winner Michael Caine (“The Cider House Rules”) plays Alfred; Gary Oldman is Commissioner Gordon; and Oscar® winner Morgan Freeman (“Million Dollar Baby”) reprises the role of Lucius Fox. The screenplay is written by Jonathan Nolan and Christopher Nolan, story by Christopher Nolan & David S. Goyer. The film is produced by Emma Thomas, Christopher Nolan and Charles Roven, who previously teamed on “Batman Begins” and the record-breaking blockbuster “The Dark Knight.” The executive producers are Benjamin Melniker; Michael E. Uslan; Kevin De La Noy; Thomas Tull; with Jordan Goldberg serving as co-producer. The film is based upon characters created by Bob Kane and published by DC Comics.